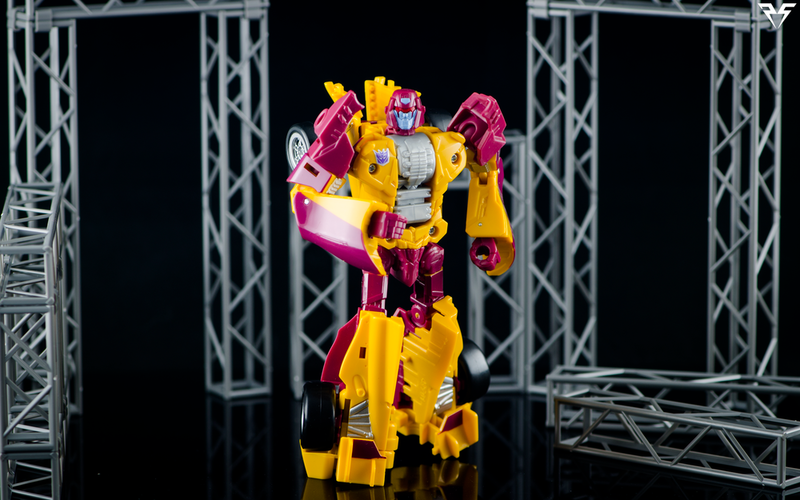 One of the latest entries in Hasbro's Combiner Wars toy line, Dragstrip is a member of the Decepticon Stunticons, that can combine to form the powerful Menasor! We'll be looking at him on his own for this review. 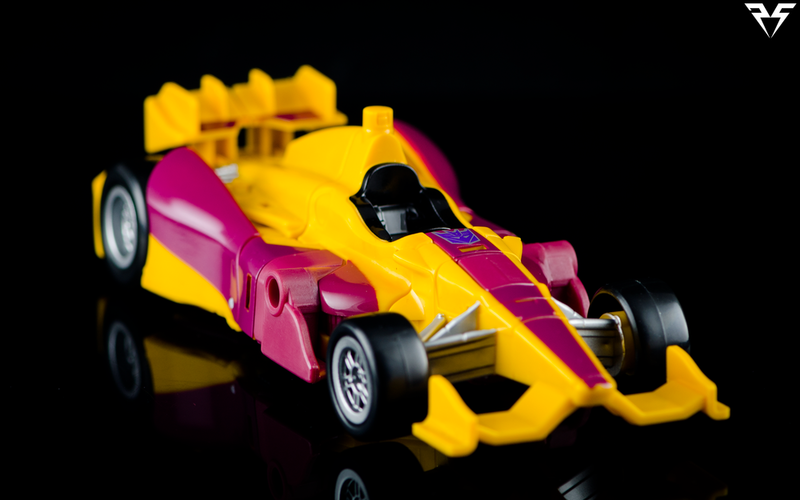 Dragstrip’s vehicle mode is a maroon and yellow rocket on wheels, modeled after a fictional F1 style race car. Unfortunately he forgoes the 6 wheeled design of his G1 predecessor. His rims have been painted silver, as well as his front axle. The alt mode is very clean with no visible robot kibble exposed. He’s got 5mm ports on both sides and a 5mm post above the cockpit. Dragstrip’s combiner weapon is the only one with a 5mm port on the underside to allow it to connect to the peg on Dragstrip’s vehicle mode. His rear spoiler can flip up to allow his combiner weapon to be mounted on the rear of the vehicle as well. Check out the gallery for an example! A simple Decepticon Tampograph adorns the top of his hood, right in front of the empty cockpit. 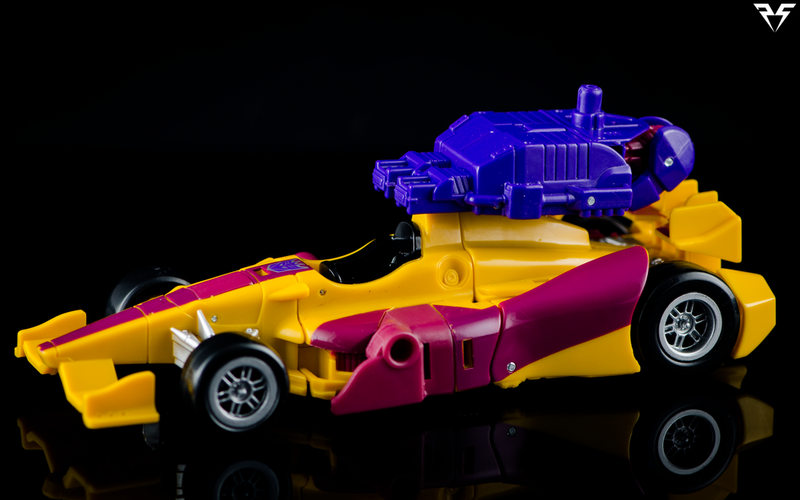 Dragstrip’s transformation is probably the simplest of all the Stunticons. Simply extend the legs and split them in half, unfold the arms and shoulders, and twist the nose of the vehicle 180 degrees and peg it to his back. 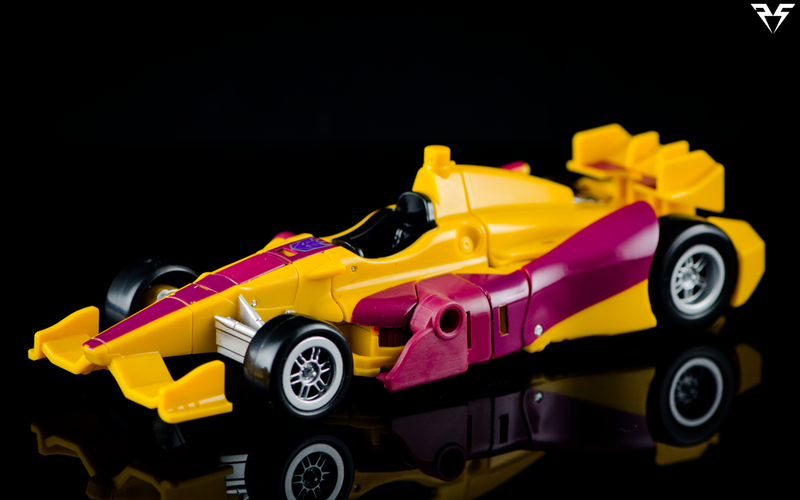 Dragstrip’s bot mode is simple but elegant. His colors stay pretty much the same, and he looks well balanced with large maroon shoulder spikes and huge, flat, rear spoilers for feet. His hands flip out from inside his forearms, there is no wrist swivel but he has a bicep swivel that can help for posing. His robot mode head is a huge departure from the G1 Cartoon and toy models. He has a dome shaped maroon helmet with a Crimson visor that looks like it is bleeding down his cheeks, and a partial faceplate that does little to hide the sour scowl he’s wearing. His shoulders both have 5mm ports on them that can be used to mount weapons, the combiner fists, or other 5mm accessories. 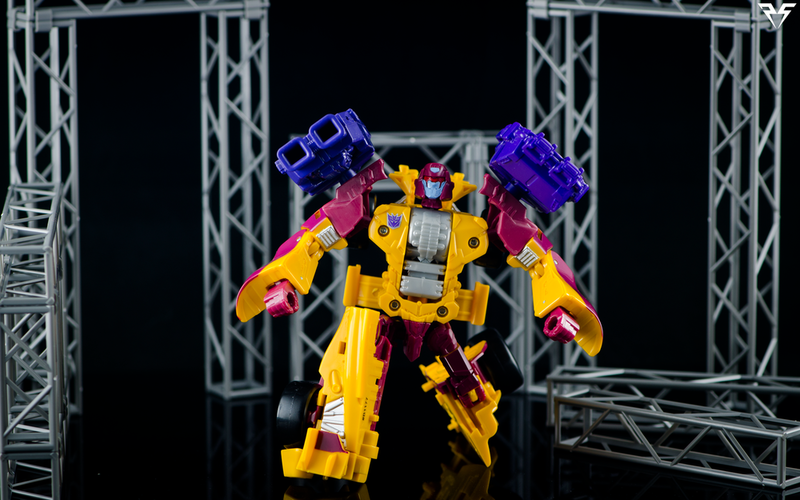 Dragstrip comes with a small purple sword with tech inspired details. The sword has a 5mm post for the handle, and another 5mm post mounted at about 45 degrees. At first glance the other peg looks like it should allow Dragstrip to hold the sword as a sort of bladed rifle, however the angle of the peg makes it very awkward for him to hold in this manner. He also comes with a purple combiner weapon, with 2 squared off blasters on the knuckle. All in all Dragstrip is a great, if very basic, toy. He looks good in both modes and has no major issues, but he also doesn't really do anything spectacular either. It would have been nice to see him shipped with a traditional blaster but his purple sword is a cool accessory that can look really menacing in the right pose. 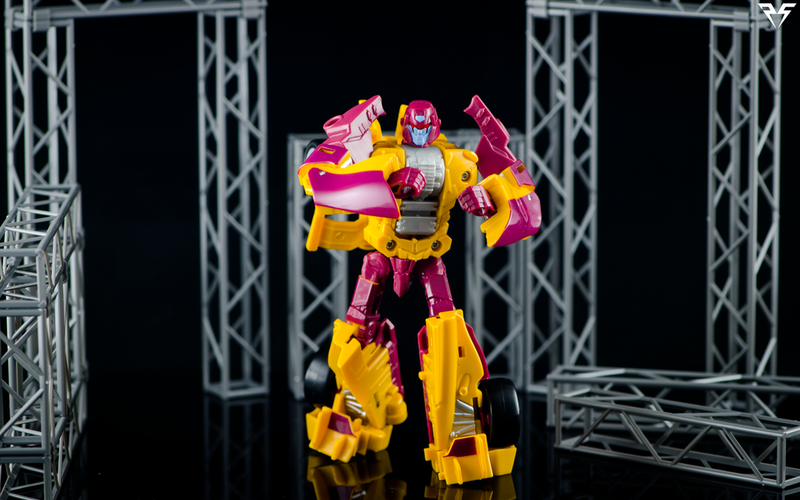 Dragstrip strives for victory, always trying to outdo the competition. While he may not be first place in my books (a fact that will forever cause him endless frustration) he is still an excellent mainline release from Hasbro. Check out the gallery below for more photos!